With 30 miles of backcountry trails and 10,000 acres of endless opportunities for outdoor recreation hiking, mountain biking or camping, Panthertown Valley has made its mark as a haven for outdoor enthusiasts. More than 25,000 people per year visit Panthertown Valley, and deteriorating gravel roads and inadequate parking have affected the overall experience for locals and visitors to the area. 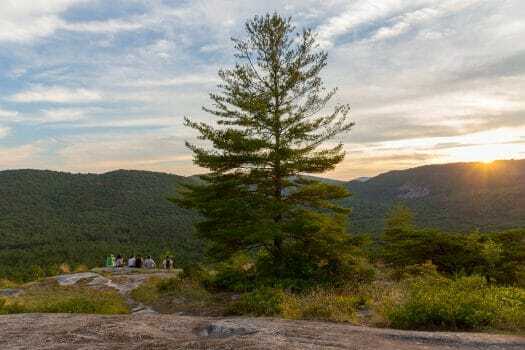 To improve public safety and access, Friends of Panthertown is partnering with Mainspring Conservation Trust to purchase 16-acres that borders the west side of Panthertown, immediately to the right of the Salt Rock entrance. The Jackson County Tourism Development Authority has donated $2,500 to Mainspring Conservation Trust to help with the purchase. If fundraising for the project is successful, the property will be purchased by Mainspring in April 2017. In Phase One of improvements, the Friends of Panthertown will begin with initial parking prep at Salt Rock trailhead to increase the amount of space available. This includes clearing the flat land in the acquisition property near the gate, and grading the area and access road near the entrance. In Phase Two, after the property is transferred to US Forest Service, Friends of Panthertown will apply for a Recreational Trails Program grant with US Forest Service. They will finish grading the parking lot, adding gravel the parking area and finish improvements to the access road. The two non-profits, Friends of Panthertown and Mainspring Conservation Trust are fundraising until April 21, the closing date to purchase the land. The public are encouraged to make a secure donation to the project online. A generous private donor has agreed to match all donations up to $100,000. The core initiatives of Mainspring Conservation Trust are: conserve the land, restore the water, and connect the people to these valuable resources. The Friends of Panthertown’s mission is to work in partnership with the US Forest Service to conserve Panthertown Valley while improving the quality of the experience of recreational opportunities in this outstanding natural resource.